The Adventures of Rosie Crucial is an historical novel full of characters that don’t realise they are historical. 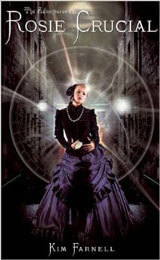 The story navigates events from the dark to the farcical in the occult underworld of late Victorian England. All Rosie wants is to avoid anything disagreeable. The Adventures of Rosie Crucial is an historical novel full of characters that don’t realise they are historical. The story navigates events from the dark to the farcical in the occult underworld of late Victorian England. All Rosie wants is to avoid anything disagreeable. However, renown attaches itself to many an unwilling soul and she knows that if she leaves everything to Constance and Emily, their lives will be filled with no more than lemon cake and ribbons. Andrew simply wants to have an adventure and Babula is only an occasional juggler. So things get out of hand very quickly. In quest of the unknown, the spectacular, bizarre and differently entertaining, this fameless five head across the globe. They move effortlessly from drawing room seances to exotic fakirs and from fairies to Ferris wheels (but never quite to Sweden). Yet lifes mundanities constantly interfere with their mission. They discover why corpses are notoriously difficult to dispose of, and how aspiration to higher thought offers little protection against the passions stirring within. However, their biggest problem is the disorganised aspect of their committee meetings. These are the people destined to lead the world into a new spiritual age. Oh, dear. Kim gained a Masters degree in Cultural Astronomy and Astrology in 2005 and her Diploma from the Faculty of Astrological Studies in 1990. She is currently President of the Astrological Lodge of London and was previously Vice Chair of the Astrological Association of Great Britain. Be the first to review “The Adventures of Rosie Crucial – Kim Farnell” Click here to cancel reply.